I had my first trial lesson in the early 1980s and went on to gain my PPL. In 2013 I began exploring the emerging world of unmanned aviation and the use of drones for aerial photography. 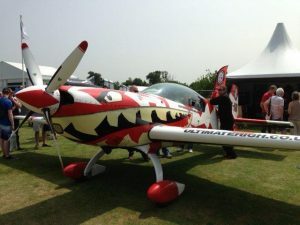 The experience of both GA and UA puts me in a strong position help others reach their target market using social media marketing for aviation businesses. Between 2014 and 2015 I built three websites, completed a course of training, and gained my PfAW from the CAA. I then went on to complete some aerial photography work for several clients as well as make videos of my own. I subsequently sold the UA business (Wessex Aerial Photography) to an existing aviation company, along with two UA websites, Copter Drones, and Drone UAV. Social Media Marketing, like Google Adwords and other Pay Per Click marketing, is simple enough to start, but you need to analyse results and adjust accordingly. Just like navigation in the air, if you want to reach your target destination on time and having used as little fuel as possible you need to understand what the instruments are telling you, where and what to adjust, and when to make those adjustments. You also need to understand your audience and to interact with them. You’ve probably heard people say that it’s all about building relationships, not trying to sell things, and they are right. For example, there’s little point in using Twitter just to send out the occasional tweet about a service or product you want to sell. Account used in this way attract few followers and end up being ignored. Worse, they can use up time and other resources, and they may lessen the impact of your brand. 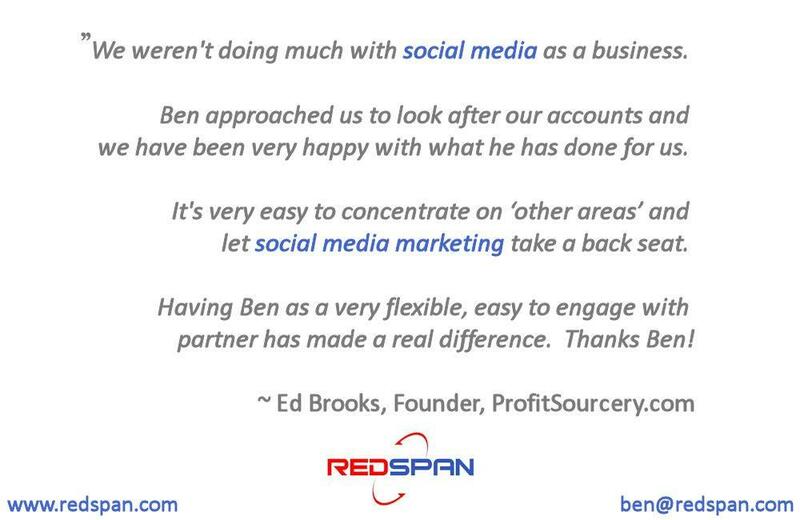 Your business needs the appropriate social media accounts for what it is you’re offering. Those accounts need to be managed, monitored, and operated with a clearly defined marketing strategy in mind. I can help you to define your business goals, formulate a plan, put it into action, check results, and adjust accordingly. Please get in touch for a no obligation chat. I’m sure there will be some way in which I can help you to fly on track and land safely where your new clients are waiting. 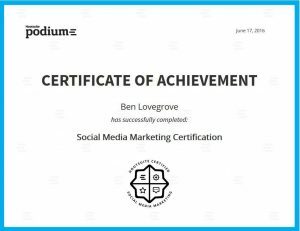 If you’re interested in learning more about social media marketing either for your own business or in order to offer it as a service to others then hop over to Hootsuite. They offer a free online course with the option of taking an exam at the end. The exam comprises 58 questions to be answered in 60 minutes and costs $199. If you don’t pass first time you can take it again. The free online training consists of short video lectures and some notes to download in pdf files. You can learn at your own pace, but it’s easy to follow and only takes a few hours to complete. So for the purpose of continuity, especially if you intend to take the exam, I recommend you complete it within a two or three days. 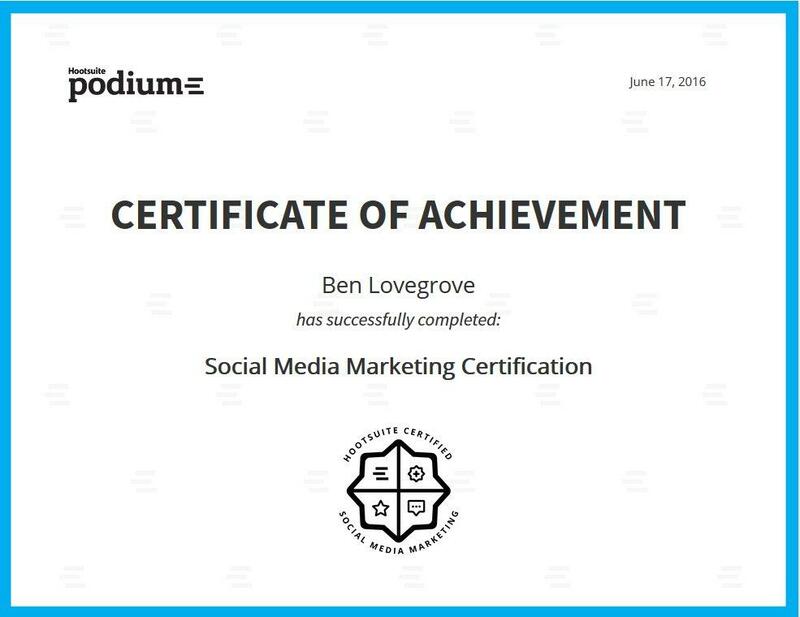 The course teaches you how to make best use of Twitter, Facebook, LinkedIn, Google+, Tumblr, and Instagram for business. Perhaps you’ve tried all of these already and you think you know how to use them all, but I learned a lot despite having opened accounts years ago. Some of the things you learn will inspire you to pause the learning and head off to implement them on your social media profiles, but it’s probably best to wait until you’ve completed the course. Take a step back and review what you’ve learned. Then develop a strategy. One of my early mistakes was to create too many profiles. It became too time consuming to manage them all and to find content to share in each of them. So my first task was to consolidate them down to a more realistic number. Then, having developed a strategy and calendar, implement it and review the results on a monthly basis. Social media marketing requires planning. You have to consider your business goals and objectives, formulate a marketing plan that’s in line with them, put it in to practice, review the results, and adjust as necessary. If you’re a business, one person or larger, this takes time and effort to learn and do. It’s one of those tasks that is often best outsourced to someone like me who can get on with it for you while you concentrate on what you do best. Contact me for more information and to discuss how we can use social media marketing to attract more leads and clients, build your brand, and help your business to grow.